From "A Rose in the Desert" to the target of European Union sanctions, what a difference a year has made for Asma Assad, the 36-year-old wife of Syrian president and ruthless dictator, Bashar Assad. In early March, London's Guardian newspaper published some 3,000 hacked emails from Syria's first family that highlight Asma's passion for crystal-encrusted French stiletto heels, British furnishings, and a lovely fondue set on sale on Amazon.com, as well as her acknowledgement that she, not Bashar, was "the real dictator." In response to the Asma revelations, the EU swiftly passed sanctions, banning Syria's first lady from traveling to Europe and freezing her assets. For many in the West, these emails and sanctions were the first indication that Asma was not the pro-reform, modern lady described in many a journalistic puff piece. When he became president in July 2000, many Middle East observers believed that Bashar Assad would usher in a period of economic and political reform. Those hopes were heightened by his December 2000 marriage to Asma. A London-born Syrian, educated in English schools including Queen's College (a girls' high school) and Kings College — Asma graduated from the latter with honors in computer science. She was so Western, in fact, that she even dropped the letter 's' from her name for a while, preferring to be called "Emma" during her early years at Queen's College. She went back to using Asma at the age of 16. In an interview she gave after becoming first lady of Syria, she explained her name change: "I can't say I was 'Emma.' No. I wasn't Emma. I was 'Emma,' as you call somebody sweetheart or sweetie or darling or so forth…. I am British and I am an Arab. I am not one or the other. I am part of both worlds." Asma certainly appeared to be part of the Western world. After graduating from King's College she worked in mergers and acquisitions at J.P. Morgan. She was even accepted to Harvard Business School. But those plans never came to fruition as she accepted Bashar's marriage proposal in mid-2000, after his father — the 30-year dictator of Syria — passed away that June. Bashar had met Asma during his period of residency in ophthalmology at the Western Eye Hospital in Paddington, London. Asma is the daughter of Fawaz al-Akhras, a Syrian cardiologist who immigrated to London in 1973. Ten years later, Fawaz founded the Syrian Arab Society, a group dedicated to bringing together the some 10,000 Syrians living in England. Bashar sent Fawaz a letter in 1991 asking for assistance in locating a place to train in ophthalmology, which paved the way for Bashar's acceptance. He arrived in England at the end of 1992 and kept in touch with Fawaz, occasionally attending the Syrian Arab Society's social events. It was during one of these events that Bashar met Asma. Although Bashar had planned to stay in London for two years, he was abruptly sent back to Damascus following the death of his brother, Basil, in a car accident on January 21, 1994. Their father Hafez had groomed Basil to inherit the proverbial throne, but with Basil's death, Bashar moved to the front of the line of succession. 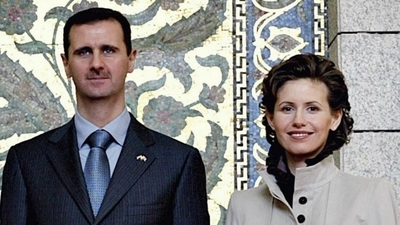 Asma and Bashar remained in friendly contact from 1993 through 2000. She later revealed in a December 16, 2002 interview in the Observer that prior to their engagement: "We hardly saw each other at all. And, if we did, it was more on a friendly basis and nothing else." As Syria specialist and analyst Eyal Zisser suggests in his 2007 book "Commanding Syria," "She did not know that she would be marrying him until he proposed." Zisser adds that "His proposal came as a surprise to many of their acquaintances… So effective was their secrecy that the announcement of the marriage prompted conjecture that the match had been arranged for political purposes, in as much as Asma was from the Sunni community," which makes-up some 74 percent of Syria's population, while the ruling Assad family hails from the 12 percent minority Alawite community. While the marriage of Asma and Bashar may have outwardly lacked the kind of romanticism associated with fairytales, it did not prevent a Western obsession with Syria's first family from taking hold among journalists and analysts. Suddenly, Bashar was considered a reformer because of his exposure to the West — which in reality was simply a dipping of his feet in Western thought during his year abroad. His fashionable wife was to be the driving force behind the reforms that never took place. Washington analyst Flynt Leverett concluded in his 2005 book "Inheriting Syria" that Bashar had a "gradualist approach to internal reform." Andrew Tabler — the specialist who recently briefed Congress on the human rights crisis in Syria — wrote in his book "In the Lion's Den" that in 2003 Asma "was the only remaining hope for her husband's reform promises." Misreading the Assads was not solely the domain of hopeful analysts and Syria observers; people at the highest levels of the US government continued to believe in the mirage. Former speaker of the House Nancy Pelosi stood on Syrian soil in April 2007 and famously declared that "the road to Damascus is a road to peace." During her visit, Pelosi had an enjoyable shopping tour through Damascus markets — as the Syrian regime was facilitating the movement of jihadists across the border into Iraq to kill American troops. Even Secretary of State Hillary Clinton bought the Assad-is-a-reformer narrative, telling CBS News on March 27, 2011: "There is a different leader in Syria now. Many of the members of Congress of both parties who have gone to Syria in recent months have said they believe he's a reformer." But no one inside the beltway was duped more than Senator John Kerry, President Obama's former informal envoy to Syria. Kerry feverishly pushed to revive diplomatic engagement with the Assad regime. Indeed, he was a frequent guest of Bashar's; the two men and their wives were known to dine together in Damascus and discuss bilateral relations. So taken with the first family of Syria was Kerry that even as the protests began in Syria, he delivered a speech in Washington that heaped praise on Assad for the generosity he personally extended to the former Democratic presidential candidate during his many visits to Damascus. Like many Washington insiders, the Western media adored Asma. In 2009 The Huffington Post published a slide show entitled, "Asma Al Assad: Syria's First Lady And All-Natural Beauty." The site was last updated on March 15, 2012 — just as the imaginary façade of Asma Assad began to crumble with the release of the hacked emails. Last spring the Harvard Arab Alumni Association's website promoted an event featuring Asma by praising her as an avid supporter of "a robust, independent and self-sustaining civil society." In 2010, French Elle voted Asma "the most stylish woman in world politics," and Paris Match called her "an eastern Diana," a "ray of light in a country full of shadow zones." Perhaps the most well-known puff piece is the Vogue article on the Syrian first lady entitled, "A Rose in the Desert." Just as the first Syrians began to take to the streets to call for reform in March 2011, the article was released to Vogue's 11.7 million readers, waxing poetic on the Assad family and Syria. But don't expect to find this Vogue piece on the magazine's website. A few weeks after the article was released it was pulled from the site and all references to it were scrubbed, no doubt because of the obvious disconnect between the image it presented of Syria and its first family on one hand, and reality on the other. The only online trace is the text that can still be found on a site called PresidentAssad.net, a fansite registered to Mohamed Abdo al-Ibrahim, a Syrian man living in Rome who lists himself as an employee of the Syrian state-run news agency. Vogue's "A Rose in the Desert" stands out for its selective focus and twisting of reality. "Syria is known as the safest country in the Middle East, possibly because as the State Department's Web site says, 'the Syrian government conducts intense physical and electronic surveillance of both Syrian citizens and foreign visitors,'" the article posits. Perhaps the author and interviewer, Joan Juliet Buck, missed the State Department's designation of Syria as a terrorist-supporting state, a title Syria has sported since the Department first released the list in 1979. The article also stated that "Bashar al-Assad was elected president in 2000, after the death of his father, Hafez al-Assad, with a startling 97 percent of the vote." The next sentence continues: "In Syria, power is hereditary." How startling is it that a rigged election to rubberstamp Bashar's rule would be overwhelming? Better, perhaps, to inquire about the disposition of the three percent who did not vote for him. Buck buys the Asma Assad image, hook, line, and sinker, describing her as having "a killer IQ" and commending her for being "glamorous, young, and very chic — the freshest and most magnetic of first ladies." As for the first lady's "central mission," it "is to change the mind-set of six million Syrians under eighteen, encourage them to engage in what she calls 'active citizenship.'" Asma now has her "active citizenship," and it has resulted in the arrest, torture, and death of thousands, while she peruses Amazon.com for the latest fashion in stiletto boots. Just as Bashar and his father before him demonstrated with their political and personal record that pan-Arabism rather than pan-Syrianism lay at the core of their ideology, Asma also brandished her pan-Arab credentials in the interview by trying to make Damascus sound even more central to Islam — and therefore Arabism — than previously considered. She explained that "The Umayyad Mosque [in Damascus] is the third-most-important Muslim site." This should surprise journalists who have grown accustomed to hearing Muslims refer to Jerusalem's Temple Mount as Islam's third holiest site, behind Mecca and Medina in Saudi Arabia. In expounding upon Syria's harmonious multicultural fabric Asma said, "We live side by side, and have historically. All the religions and cultures that have passed through these lands — the Armenians, Islam, Christianity, the Umayyads, the Ottomans — make up who I am." Buck, to her credit, then asked, "Does that include the Jews?" to which Asma replied in the affirmative: "There is a very big Jewish quarter in old Damascus." Of course, that Jewish quarter has been largely vacant since 1992 when the Jews of Syria were first allowed to leave the country. In the article, Buck calls Bashar "a precise man" — which would come as a shock to anyone who has ever read any of the lengthy and rambling speeches Bashar has delivered — the epitome of vague verbosity. And in the context today of a Syrian uprising where regime thugs have murdered 10,000 people and detained, imprisoned, and tortured many more, it is chilling to read in Vogue that Bashar was attracted to studying eye surgery because, as the Syrian leader put it, "it's very precise, it's almost never an emergency, and there is very little blood." As the year of Syrian protests continued and the regime amplified its violent response, many wondered if Asma would stand by her man. Clearly, this could not be what Asma envisioned when Bashar surprised her and offered her marriage along with the role of first lady back in 2000. Surely such a Westernized, chic, and modern champion of reform in Syria would escape back to Britain, disgusted with her husband's bloody response to the protestors and his disregard for all human rights. Surely she would be eager to avoid the type of end the people handed Muammar Gaddafi in Libya. Asma's friend Mayassa al-Thani, the daughter of the emir of Qatar, even asked her directly in an email exchange from last December, "how can i help you? i cant imagine you agree with what is going on — you've done such great work, it can't all be lost on the basis of weeks of bad policy? Honestly — how can we be of help?" Earlier, Asma wrote her, complaining that "Doha is not a popular destination with Syrians at the moment!" A month and a half passed before Mayassa wrote her again, saying, "in all honesty — looking at the tide of history and the escalation of recent events — we've seen two results — leaders stepping down and getting political asylum or leaders being brutally attacked. i honestly think that this is a good opportunity to leave and re-start a normal life… i only pray that you will convince the president to take this as an opportunity to exit without having to face charges… i am sure you have many places to turn to, including doha." The release of the leaked emails and subsequent response of the European Union puts to rest the question of where Asma stands. In a December 14, 2011 email to a friend she wrote, "I'm the real dictator, he has no choice." Indeed, that is quite an upgrade in her status. In the Vogue piece, Buck said that the "household is run on wildly democratic principles," quoting Asma as saying, "We all vote on what we want, and where." And in February she turned out, all smiles, to vote with her husband in the sham Syrian referendum that could theoretically see Assad entrenched as president until 2028. Most puzzling is her January 17, 2012 message where she cracked a joke at the expense of the people of Homs, shortly before the regime's siege of the city that would claim several hundreds of Syrian lives and those of US reporter Marie Colvin and French photographer Remi Ochlik. It's not just that she was making light of it; her father, Fawaz, was born and lived in Homs until he moved to London in 1973. As the death toll continued to mount in Homs, her office emailed a statement to The Times of London in January, after it ran an article asking "What does Assad's wife, an intelligent, educated woman raised in liberal Britain and seemingly dedicated to good works, think of the evils being perpetrated daily across Syria…? Is Asma Assad, 36, indifferent to the suffering being inflicted on her fellow Sunnis by her husband's Alawite henchmen — or appalled?" Her office's statement read: "The president is the president of Syria, not a faction of Syrians, and the first lady supports him in that role." It continued: "The first lady's very busy agenda is still focused on supporting the various charities she has long been involved with and rural development as well as supporting the president as needed. These days she is equally involved in bridging gaps and encouraging dialogue. She listens to and comforts the families of the victims of the violence." Before releasing the statement, she appeared with a warm smile beside two of her children to support her husband as he spoke at a pro-regime rally. The suggestion that she listens to and comforts the families of victims is simply absurd. Perhaps in the West most of all, people are fascinated by princesses and fairytales. There is a bottomless appetite for the Royals in Britain and there is a similar media infatuation with Jordan's cosmopolitan Queen Rania al-Abdullah, who has graced the covers of more fashion magazines than Asma Assad. Maybe getting to know the first family in an otherwise opaque country works like a monarchy as well. As the Vogue article points out, "In Syria, power is hereditary." The first lady is treated like a princess, and the media gazes on in awe. Never mind that behind all of Asma's glitz and glamour lies a simple modern-day Marie Antoinette with "let them eat cake" in her heart. If the press were honest, the leaked emails would not come as a surprise, and the media would not be forced to cover up past interviews that glamorized Asma Assad. Yet while the media is known to sometimes distort reality in portraying a story, it cannot excuse the analysts and politicians who have consistently been wrong about the regime in Syria. The media have taken their cues from politicians like Nancy Pelosi and John Kerry, the seasoned Washington elite who should know better than to buy Syrian snake oil or fall for the pseudo-aristocratic claptrap. Their inability to see reality was bolstered by a cadre of analysts at Washington-based think tanks who peddled in dangerous falsehoods. It is well past the time that elected officials and serious analysts remove their rose-colored glasses and deal with reality as it is. They should be eating their fill of cake as well. As for Asma, she will likely ride out the Syrian storm with her husband Bashar because there is no reason for them to believe that the regime will crumble. As the conflict currently stands, and despite the horrific and mounting death toll, effective outside intervention is not in the cards; Washington has proven unwilling to lead, and the first family has not been presented with the stark choice between staying and dying, or leaving and living. And they have more guns, and they are not afraid to use them. Still, there remains the temptation to believe that Asma is trapped, to believe that she is unable to escape or that she is torn between dueling loyalties – the lone rose blooming in a harsh political desert. That is nonsense. Her father, Fawaz al-Akhras, has thrown his stock in with the first family. He first introduced his daughter to Bashar in 1993, and as the leaked emails demonstrate, he continues to play an active role in advising the first family on how best to mislead the West. Fawaz is part of the regime's deception and his fashionable apple, Asma, did not fall far from the tree. Asma's father in-law, Hafez Assad, ruled Syria for 30 years with an iron fist and was known the world over as one of the most vicious dictators of the modern era. And her husband Bashar didn't become a ruthless tyrant overnight either. Asma knew what she was getting into. It is commonplace for dictators to marry wives that their people and Western media can adore. It's Public Relations 101 among the ruling despots of the Middle East, and Asma was to present the softer side of the Assad family. As she admitted, from 1993 until 2000, she and Bashar were just friends — not involved in an intimate relationship. The marriage was a quid pro quo — a political transaction. She gave up Harvard Business School to play princess in Syria. But the cold light of reality has illuminated even the darkest corners through the cracks in the Assad façade. And the fine line between being along for the ride as an observer and being complicit in heinous war crimes was crossed long ago.